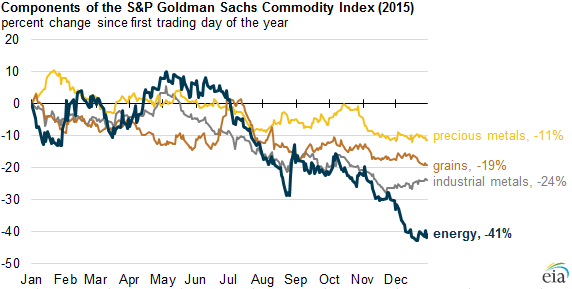 Each of the 16 commodities in the S&P GSCI Energy, Grains, Industrial Metals, and Precious Metals indices declined in 2015, with prices of some of the energy commodities falling more than 30%. Nickel, diesel, and crude oil had the largest price declines among the 16 commodities in the four S&P GSCI indices, while lead, corn, precious metals, and gasoline had relatively smaller price declines. Each commodity in the S&P GSCI is reweighted each year based on the commodity's world production and trading volume to measure its relative importance in the global economy. Note: These commodities are included in the S&P GSCI Energy, Grains, Industrial Metals, and Precious Metals indices. 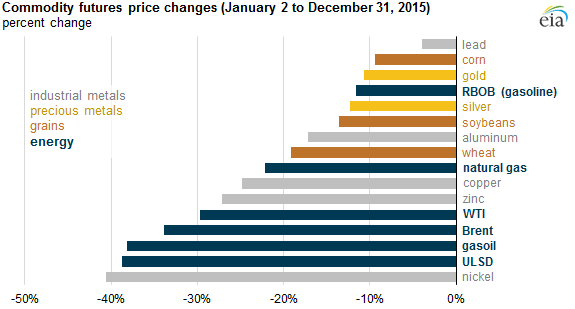 All price changes reflect changes in front month futures contract price for each commodity. WTI is West Texas Intermediate, RBOB is reformulated gasoline blendstock for oxygenate blending, and ULSD is ultra-low sulfur diesel. Metals. Copper and aluminum make up more than three-quarters of the S&P GSCI Industrial Metals index, with zinc, nickel, and lead making up the remainder. The prices of industrial metals were affected by declining activity in China's manufacturing sector along with the economic slowdown of many developed and emerging markets. Nickel had the largest price decline of all the major S&P GSCI commodities because of lower-than-expected demand for stainless steel from countries like China.